Back in November I wrote about what I believe to be the best part of my job; running into Carlson High School graduates that are success stories and hearing about how well they are doing in the "real world." Carlson High School graduate Nathan Matatall is clearly one of these success stories. After graduating from Carlson High School and Michigan State University Nathan has gone on to very successful career at Dell Computers. The News Herald even published a feature piece on Nathan a few years ago. This past week, Nathan provided my family with a once-in-a-lifetime experience that I will never forget. Nathan, my former public speaking student, contacted me via email a few weeks ago and inquired about taking my kids on a tour of Marine One (one of the helicopters used to transport The President of the United States and other dignitaries) and to possibly attend the landing of Air Force One when President Obama was scheduled to arrive in Detroit. I was very excited about the opportunities and told Nate if it was not a problem my family would love to attend. I do not want to get too detailed, but I will say Nate is close friends with an individual that is involved with transportation of White House officials. This is how the arrangements would be made. 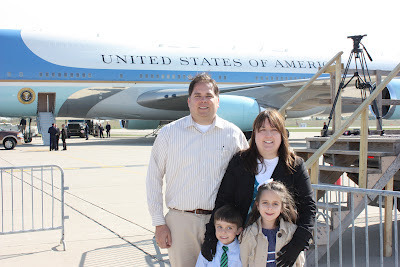 After enjoying a tour of Marine One this past week at Detroit Metro Airport my family and I were amazed. Just the tour alone provided me with enough memories and photographs to last a lifetime. Little did I know what would take place just a few days later back at the Detroit Metro Airport would go beyond my wildest dreams. Nathan informed me that two spots were available to join a select few to watch Air Force One land and President Barack Obama exit the plane for his fundraising visit to Metro Detroit. My wife and I discussed the event and decided that our daughter Chloe and I would accept the invitation. A late phone call on Monday evening from Nathan surprised me, informing me that my wife and son would also be able to attend as two other spots became available. Wednesday, April 18th, 2012 will be a day my family and I will never forget. My wife did a wonderful job (as usual) getting the kids all ready for the President's arrival. Elisa always puts our children first, and she did once again. The kids looked amazing, and with some help from my mother-in-law, both Chloe and Nate brought tiny American flags to wave as President Obama touched down. After being checked in by security we were transported out to the runway with approximately fifty other supporters. We all eagerly awaited the giant 747 carrying the President of the United States. Once the plane arrived, I was not sure if my family was going to have a chance to meet President Obama. His limo pulled near the stairway used to deplane. I quickly discovered that we would have a chance to meet the President, as he sprinted down the stairs and made his way toward the crowd. The crowd became excited and pushed toward Mr. Obama. I snapped a few photos and became caught up in the excitement of the moment. I remember the President asking the crowd, "How is everyone doing today?" I knew I wanted my children to be able to meet the President, so I put my camera down and started looking for Nate and Chloe. I wanted to get them close enough for a handshake or more. Little did I know what was about to happen. Thankfully, I was able to grab my daughter and get her close enough for a handshake. As Mr. Obama took my daughter's hand, he even asked her name. She responded "Chloe," with a big smile! Barack Obama extended his hand to me after greeting my daughter and I quickly gave his hand a shake and said, "thank you Mr. President." My wife was nearby with my son Nate on her shoulders. Nate caught the President's attention by waving his flag and waving at Mr. Obama. That is when President Obama asked for a "high five!" Nate immediately obliged and shared a high-five with the sitting President of the United States. I did not get photos or videos of the event. I was too caught up with what was taking place, living in the moment (and I loved it, no regrets). Thankfully, media outlets captured the high-five! 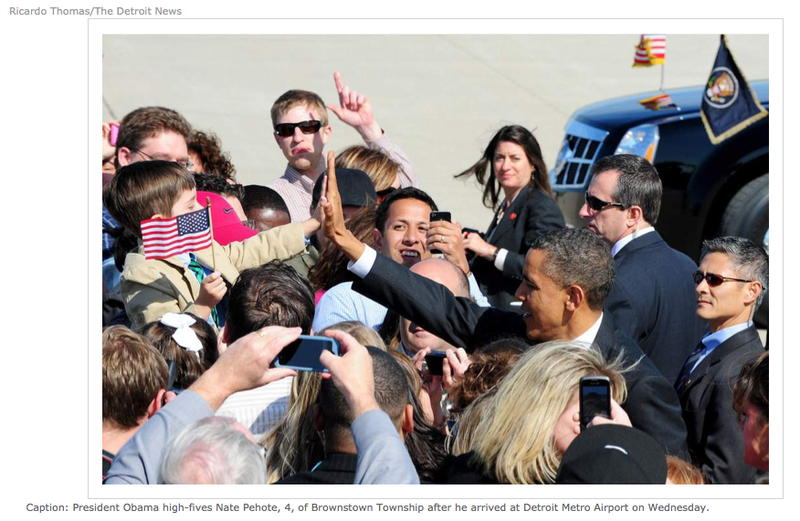 These amazing photos ran in the online edition of the Detroit News as well as this story on the President's visit to Metro Detroit. My family and I still have chills re-living the event each day this week. I immediately ordered a number of the photos from the The Detroit News Photo Store. Thanks to a friend of my wife, I was able to locate a video of the event on YouTube. It is included here, the now famous high-five takes place at about six minutes into the video! Thanks to Facebook and digital videos and photos I was able to capture much of the excitement of this past week. However, nothing will ever take away the few seconds I was able to watch my children greet the President of the United States of America. No matter what your political leaning, he is still the Commander in Chief and he deserves respect. I would like to take this time to thank Nathan for his generous offer. You have provided my family with more than I could ever ask for. I wish you the best with your career and I know you will continue to make Carlson High School proud! Amazing story Mike. I'm going to bring this to the attention of our editor to possibly print. Thanks Dave, it was an amazing week. Keep me informed and let me know if you need any more information.